Raga on the Ganges is a comforting resort situated in a tiny hamlet called Singtali near Byasi, Rishikesh. Amid the aesthetic beauty the resort provides rapturous delight to its guests. A Unit of Amritara Group, it is one of the finest resorts that offers relaxation, adventure, bliss and jaw dropping river rafting experience. Being secluded from the city it provides solitude and ecstasy at a comfortable lodge in the wilderness. Every nook offers a splendid view of Alpine hills, meadows, wild seasonal flowers and thirsty nectar sucking birds on the flowering trees. The luxury resort offers a variety of adventure sports such as white water rafting, rappeling, trekking, cycling and canoeing. The resort has its own Teertha Spa which means Water of Life in sanskrit. The spa is run by Kairali Ayurveda and a team of highly trained therapists and professional physicians. Another Property of Amritara Private Hideways is Anant Rasa in Sitlakhet (Almora). 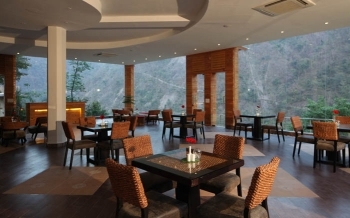 The resort is located in Singtali near Byasi at 35 kms from Rishikesh on Badrinath highway. The resort is best suited for leisure, family holiday and for adventure trips. The luxury resort promises a thrilling adventurous trip or leisurely spa vacation. One can bask under the sun or explore the wilderness. The pristine environs provide a mystical experience in which the spirit is exalted to a knowledge of divine things. 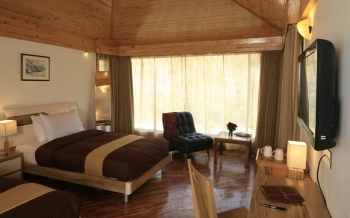 The resort provides accommodation in warm and cosy rooms. Each room offers a breath taking view of sun kissed emrald green blue waters of the the holy Ganges, Shivalik ranges and sparkling sand. The rooms have been categorized as Standard rooms and Cottage. Both the rooms are equipped with modern amenities such as attach bathroom with hot/cold running water, intercom facility, cable Tv, king sized double bed or American twin bed. The Long Huts and the Long Cottages are slightly spacious than the standard rooms but come with same amenities. Tarana the fine dining restaurant of the resort offers a wide variety of scrumptious cuisines. Guests await the dinner service because of delicious Indian, Continental, Chinese and local Garhwali cuisines. Under the guidance of ayurvedic physicians and vaidyas the experienced chefs of the restaurant have introduced an array of ayurvedic cuisines. For health conscious people ayurvedic cuisines is like a boon. The guests should not miss the specials of the day which comprises of seasonal vegetarian and non vegetarian Garhwali cuisines. The resort also serves alchoholic beverages, cocktails and sizzling kebabs which you can enjoy in a bonfire night under the celestial sky. - Extra Adult (Above 10yrs): INR 1500/- Inclusive of Breakfast & Taxes. - Extra Child (06–10yrs): INR 1000/- Inclusive of Breakfast & Taxes. The resort is located in a small peaceful village called Singtali in Tehri Garhwal. Singtali is at an distance of 2 kms from Byasi and 35 kms from Rishikesh. One can hire taxi or take bus to reach at the resort easily from Rishikesh. Near by cities are Rishikesh, Chamba, Haridwar and Dehradun. Rishikesh railway station is the near by railway station to Singtali. Jolly Grant Airport in Dehradun is the nearest domestic airport. Whereas, Indira Gandhi International Airport is the nearest international airport to Singali. It is easily accessible due to the availability of motorable roads. The pristine village is surrounded by verdant forests, clear water and silvery sand which makes it an ideal tourist destination.